Bee in Oz Block finished! Oh what a feeling! To quote a famous ad. I really had a hard time with this block. As you all know I’m not a very good machine sew-er and this was really hard especially the right angle seams at the end. Anyway it’s done and hopefully I’ll be able to post it off to Sue early in the week. No way I could have made a machine do that! Great block. Wow, that’s a complicated block!!! Looks great! and the Kaffe fabrics work really well in those narrow strips… never thought to use it that way! Wonderful work ! I could never have done that on a machine and I am not even sure about hand.. Now that you have done it would you find it easier a second time? The fabrics and their flow – the color is fantastic. Congrats Munaiba – a really super block! 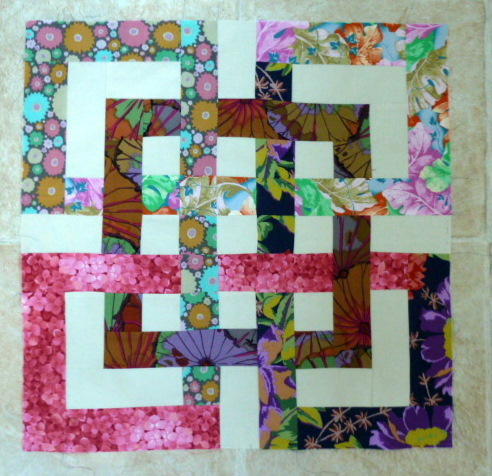 My block looks wonderful, I can’t wait for it to get here and let it play with the others. Thanks for the great work, next time I will go for something easier like stars. I love it!! Your color choices are beautiful! I can’t take credit for the colour choices. Sue sent these fabrics for me to sew so it’s her colour sense that works so well.